Cap and trade is a market-based policy tool for protecting human health and the environment by controlling large amounts of emissions from a group of sources. A cap and trade program first sets an aggressive cap, or maximum limit, on emissions. Sources covered by the program then receive authorizations to emit in the form of emissions allowances, with the total amount of allowances limited by the cap. Each source can design its own compliance strategy to meet the overall reduction requirement, including the sale or purchase of allowances, installation of pollution controls, and implementation of efficiency measures, among other options. Individual control requirements are not specified under a cap and trade program, but each emission source must surrender allowances equal to its actual emissions in order to comply. Sources must also completely and accurately measure and report all emissions in a timely manner to guarantee that the overall cap is achieved. What Is a Cap-and-Trade Program? A cap-and-trade program is an environmental policy tool designed to reduce emissions of a pollutant by placing a limit (or cap) on the total amount of emissions that can be released by sources covered by the program during a fixed time period. The overall cap on emissions is implemented through a system of allowances. Each allowance represents the right to emit a specific amount of emissions, and each emissions source covered by the program must submit enough allowances to cover its actual emissions. These allowances, sometimes called permits, are initially allocated to affected sources or auctioned off by the agency implementing the program. Allowances can be traded, which creates an incentive for those who can reduce emissions most cheaply to sell their allowances to those who face higher emission reduction costs. The incentive to trade allowances persists as long as one or more sources can reduce emissions by an additional unit at a lower cost than some other source faces to achieve its last unit of emissions reduction. Therefore, allowances will be traded until the marginal cost of emission reduction is equal across all covered sources. At this point, the pollution level required by the cap is achieved — theoretically at the lowest possible cost to society — regardless of how the allowances were initially allocated. How Does a Cap-and-Trade Program Work? Not all cap-and-trade programs are identical. Below is a list of four characteristics shared by all cap-and-trade programs, with some possible variations shown. These variations could affect how a particular program works. 1. A limit or cap on emissions of a pollutant is established. Who is required to limit their emissions. Is it all sources of emissions or just some sources of emissions? What area the cap covers. Is it a region or State, the whole United States, or a group of nations? When emission limits take effect. Will the cap be in place in the near term or at a later date? Whether the cap will become tighter, meaning the total allowable level of emissions drops over time. If so, how quickly will this decrease happen? When the cap is in place. Will it be in effect for a season — such as just for the summer months — or is it applied for the whole year? 2. An allowance must be surrendered for every unit (often a ton) of emissions generated. Who must submit allowances. While this depends on the specific cap-and-trade program, some examples include producers of the polluting substance, distributors of a product whose production or consumption generates emissions, States, or even nations. How allowances are initially distributed. Allowances could be auctioned, distributed for free based on current or historical emissions, or given out using some combination of an auction and a free distribution. In an auction, allowances are sold to the highest bidders. Uses of auction revenue depend on the specific cap-and-trade program, and could include the distribution of a portion of the revenue to consumers. 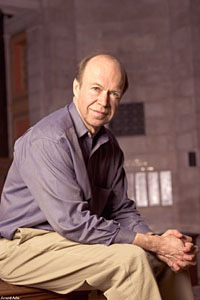 Whether the program allows for the purchase of offsets in lieu of allowances. Offsets are certified reductions in emissions from sources that are not required by the cap-and-trade program to restrict their emissions. 3. Allowances can be traded. Here's an example of how the trade could work. Emitter ABC found it really easy and cheap to reduce its emissions below the level covered by its allowances, while Emitter XYZ had a tougher time. ABC was able to make larger reductions in its emissions and offered to sell its extra allowances to XYZ. This transaction was a good deal for XYZ because the cost of allowances it bought was lower than the cost of equipment needed to reduce its own emissions to a level that matched the number of allowances it held before buying more allowances from ABC. How much an allowance costs. 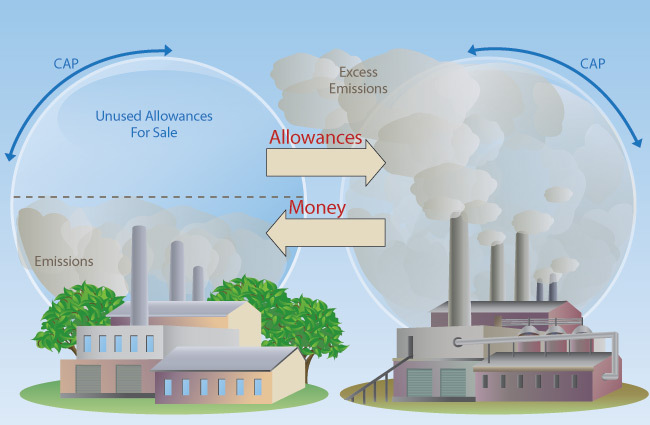 In general, the allowance price depends on the options available to reduce emissions and the demand for allowances. If there are relatively low-cost options to reduce emissions, the price of allowances would be lower. Whether emitters are allowed to save — or “bank” — allowances, either for their own future use or to sell to someone else later. Some proposals might also allow the current use of a future period’s allowances. 4. Actual emissions are measured and penalties are assessed if targets are missed. Depending on the program, these tasks could be the responsibility of one or more governmental agencies. How Do Cap-and-Trade Programs Affect Our Use of Energy? The burning of fossil fuels, including coal, oil, and natural gas, is the main source of carbon dioxide — the most important greenhouse gas produced by human activity — and a major source of other emissions. A cap-and-trade program for greenhouse gas emissions would increase the cost of using fossil fuels, making them less competitive with non-fossil energy resources and increasing the overall cost of energy to consumers. The cost of using coal, which has the highest carbon dioxide content and the lowest price per unit of energy among the fossil fuels, would be most affected by a cap-and-trade program for greenhouse gases. Why Might a Cap-and-Trade Program Be Considered? A cap-and-trade program allows emitters to have flexibility in their approach to reducing emissions. An alternative environmental policy might require each regulated source to use a specific emission control technology. With a cap-and-trade program, the overall cap on emissions is fixed, but the compliance approach by any individual source need not be specified. This flexibility allows parties to choose the least costly option and should reduce the cost of reaching the overall emissions cap. The implementation of the U.S. cap-and-trade program for sulfur dioxide beginning in 1995 is an example of the benefits of flexibility in reducing environmental compliance costs in the energy sector. Allowances for sulfur dioxide emissions were actively traded as coal-fired electricity generating units covered by the program chose a variety of compliance strategies. These strategies included installing scrubbers, switching to lower sulfur coal, and buying allowances. Where Has Cap-and-Trade Been Used? Cap-and-trade programs have been used to limit several different types of emissions in State, U.S., and international contexts. As noted above, a cap-and-trade program limiting sulfur dioxide emissions has been operating in the United States since 1995. The European Union established its Emissions Trading System for greenhouse gas emissions in 2005. In 2009, the Regional Greenhouse Gas Initiative established an interstate cap-and-trade system for greenhouse gas emissions covering electric power plants in 10 northeastern States. Recently, there has been a lot of discussion about the Federal Government establishing a nationwide cap-and-trade program for greenhouse gas emissions. ‘Cap & Trade’ increases costs to the public as does ‘Tax & Dividend’, but without the dividend. Thus it should be termed ‘Tax & Trade’. Part of the reason for the pseudonym is to avoid the stigma of a tax, under the presumption that the public is too gullible to figure it out. Other parties support ‘Cap & Trade’ because they hope to profit – it is a give-away to special interests, who feel, based on extensive empirical evidence, that they will be able to manipulate the program through their lobbyists. Except for its stealth approach to taxing the public, and its attraction to special interests, ‘Cap & Trade’ seems to have little merit." Cap&Trade does not have a prayer of phasing out fossil fuel emissions fast enough to save the planet, e.g., allowing us to phase-out coal-fired power plants. Clearly there must be people in the Obama administration who understand that. Yet Cap&Trade is still talked about as if it were something good. One wonders: do they really believe we have "a planet in peril"? In my testimony I noted that a "Cap" raises the price of energy, just as does a simple honest carbon tax on oil, gas and coal at the first sale at the mine or port of entry. "Cap" is a pseudonym, disguising the fact that it is a tax, assuming that the public is a bunch of dummies, who will never catch on. With all its hooks and eyes, Cap&Trade will allow a lot of funny business. At least we would get a few Wall Street millionaires back in business, via speculation and gaming the Cap&Trade system (funded by John Q. Public, of course). On the train I read on politico.com that the number of lobbyists in DC working to influence federal policy on climate change increased in the past few years by 300% to 2,340 lobbyists -- four climate lobbyists for every member of Congress. At least the alligator shoe business is doing well. Not too good for alligators, though." Banks like Goldman Sachs and Credit Suisse have formed New York climate desks ahead of U.S. regulations, in part because the country could be a big buyer of global credits if world carbon markets eventually link up. The charts below show the increase of green house gases from 1990 to 2009. The increased costs imposed by a cap-and-trade program would be passed down by companies to their consumers in the form of higher prices on energy products. The estimates by people supporting Cap and Trade are that the average family will pay an extra $350.00 a year for increased costs associated with this program. The opponents estimate the amount to be over $3000.00. Many companies and individuals will get very rich with cap and trade. Everything in the United States will cost more to the end user -the consumer. And the effect on global warming and climate change will be minimal if at all.